Advances in wireless communications, storage capacity, embedded processing power, and IT technologies have led to inexpensive devices, sensors, and actuators with increased computing power and low power consumption. These advances provide a huge opportunity for growth in M2M/IoT applications. M2M/IoT technologies will benefit a broad range of market segments: smart grid, telematics, eHealth/mHealth, vehicular systems, industrial control, home automation, and environmental monitoring to name a few. Global standards are defining service layer solutions to accelerate the development and reuse of M2M/IoT data and applications. 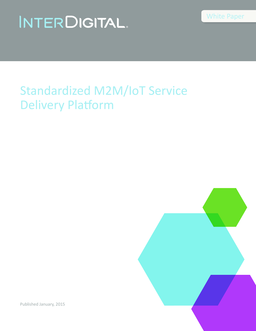 This white paper illustrates how InterDigital’s Standardized Service Delivery Platform (SDP) allows solution providers to capture the full potential of their M2M/IoT businesses.